A multi-level standing desk to give you bigger flexibility in your busy workspace. 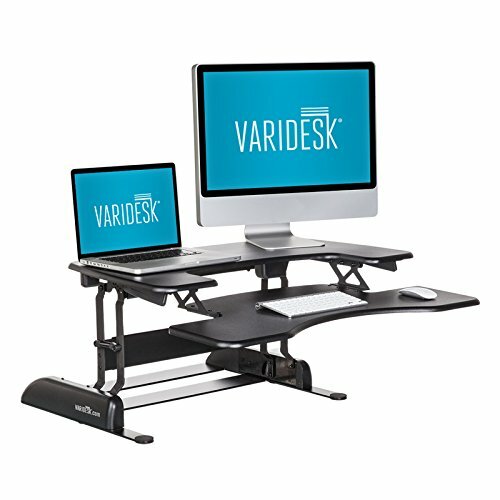 The Varidesk Pro Plus 36 standing desk is your flexible office furniture solution that is built with high-quality tools, is easily installed (requiring no assembly), and is easy to lift, with Varidesk’s patented spring-loaded lifting mechanism. Designed to accommodate dual-monitor setups, its open work surface, gives you room to setup your complete office for comfortable usage. Can be adjusted to 11 different positions in height. No assembly required, start working in minutes. Designed with QuickGrip hand-bolts, Varidesk is the ultimate solution for those who are looking to have more flexibility within the work day. Explore the freedom to move by sitting or standing without having to stop the flow of creativity. Enjoy the benefits of a standing desk today!